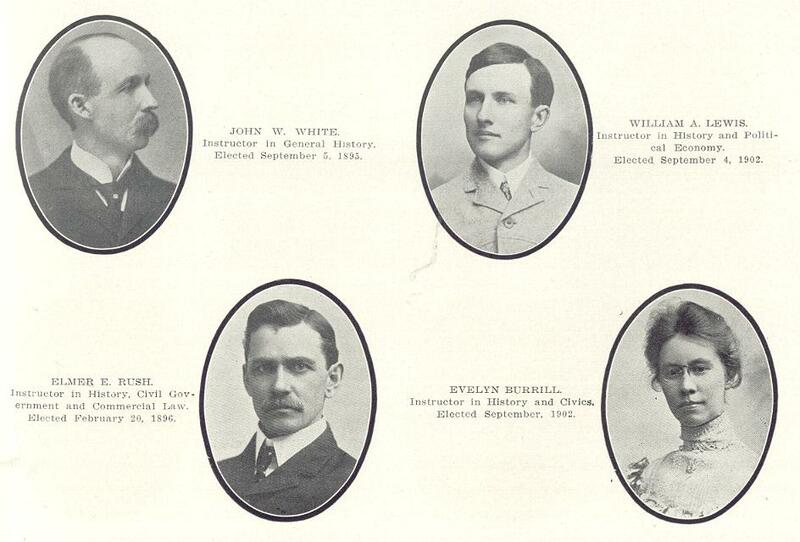 Comments: Elmer E Rush (Nee: ) | Kansas City MO USA | 1901-1920 | Comments: Faculty 5 - 1903*Centralian* Central High School Yearbook. Click below to see all images posted from this yearbook. Contact:Webmaster@deadfred.com 9/15/14 Dolores Rush writes You have a photo of an Elmer E. Rush , but I believe I have additional information about him. I have a 4vol. set of encyclopedias called Buftons Universal Cyclopaedia in which he is an editor: Elmer Ellsworth Rush, M.A., LL.B., Editor of History of Civilization, and Progress of the World. Mutual Publishing Co, Kansas City, 1925. The other editors are William A. Colledge, Paul Ingebrikt Neergaard, Samuel MacClintock, Earl Cranston Jeffrey, Ulysses G. Alexander, Charles Higgins, C. Ward Crampton, & James D. Bufton. Illustrated by Mr. & Mrs Walter Bailey.